REDDING, Calif. -- An explosive wildfire has nearly tripled in size overnight in Northern California and prompted closure of a major freeway, just weeks after a nearby blaze that left neighborhoods in ruins and killed eight people, officials said Thursday. 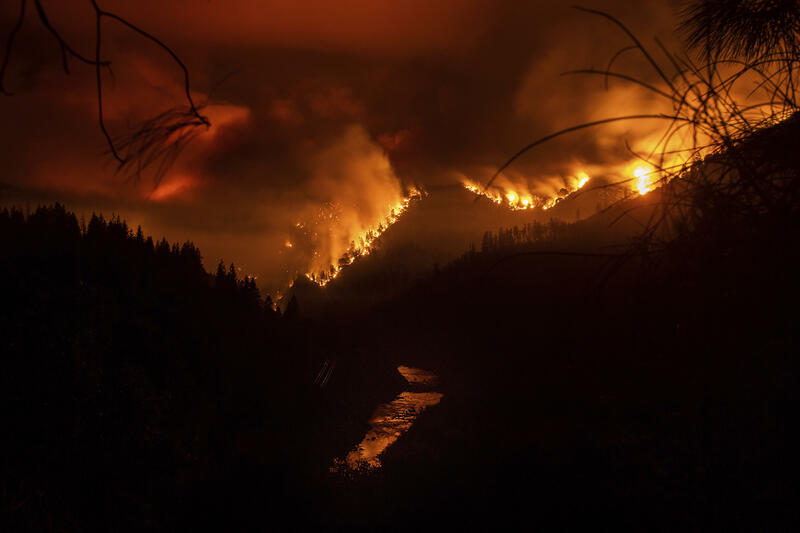 The fire that erupted Wednesday afternoon and devoured timber and brush on both sides of Interstate 5 near the Oregon state line had expanded to 23 square miles Thursday, prompting mandatory evacuations, the U.S. Forest Service said in a statement. That's up from 8 square miles burning Wednesday. Authorities said Thursday night that 45 miles of I-5 will remain closed until at least Friday morning. The highway runs north from the Mexico border through California, Oregon and Washington state to the border with Canada. The California Highway Patrol said the closure in Shasta County has significantly snarled traffic. The agency warns motorists and truckers to avoid the region if possible. About 17 big-rigs were abandoned and at least four caught fire, Lt. Cmdr. Kyle Foster of the California Highway Patrol's Mount Shasta office told the Los Angeles Times. At least two trucks were partially melted. CBS Sacramento reports some of the rigs were "barely recognizable." This dramatic time lapse of the #DeltaFire will show the smoke plume and pyrocumulus cloud during the day, and the fire at night. California's insurance commissioner said Thursday that victims of that fire and one in the Mendocino area - the two largest blazes in the state so far this year - have filed more than 10,000 claims so far totaling $845 million. California's legislature budgets for firefighting based on the historical average costs. Cal Fire has requested extra money in seven of the past 10 years, but never this early, according to the Department of Finance.